I have always felt that many of our health problems are caused by a Physical, Chemical or Emotional trauma to our autonomic nervous system. I discovered this phenomenon in 1979 while working with Migraine Headache patients. They had a very common statement “ever since” which was followed by an account of a physical, emotional or chemical event. In 1980 I started on a journey around the world. I returned home in 1982 and went back into practice without finding a scientific answer. In 1979 Dr. Ryke Hamer also made a very similar discovery. He has spent his life trying to prove this phenomenon to the scientific community. I hope that by reading the following article you will have a better understanding of why I rely so heavily on the patient history. Dr. med. Mag. theol. Ryke Geerd Hamer, born in 1935 in Frisia (Germany), studied medicine and theology at the University of Tübingen. At the age of 22, he completed his master’s degree in theology and then, four years later, received his professional license as a doctor of medicine. The following years he practiced at different university clinics in Germany. In 1972 Dr. Hamer completed his specialization in internal medicine and began to work at the University clinic in Tübingen as an internist in charge of cancer patients. At the same time, he ran a private practice with his wife Dr. Sigrid Hamer, whom he had met during their studies in Tübingen. He also showed an extraordinary talent for inventing medical devices. Among others, he owns the patent for a non-traumatic scalpel (Hamer-Scalpel) which cuts twenty times sharper than a razor blade, a special bone saw for plastic surgery, and a massage table that automatically adjusts to the body’s contours. His inventions provided Dr. Hamer and his family with the financial means to move to Italy, where he realized his plan to treat the sick in the slums of Rome free of charge. On August 18th, 1978, while in Rome, the Hamers received the shocking news that their son Dirk had been accidentally shot by the Italian Prince Victor Emanuel of Savoy. On December 7th, 1978, Dirk succumbed to the injuries and died in his father’s arms. Shortly after Dirk’s death, Dr. Hamer was diagnosed with testicular cancer. Since he had never been seriously ill, he postulated that the development of his cancer could be directly related to the unexpected loss of his son. In fact, he would eventually, in honor of Dirk, call this unexpected shock a DHS or “Dirk Hamer Syndrome”. Dirk’s death and his own experience with cancer set Dr. Hamer on an extraordinary scientific journey. At the time head internist of a cancer clinic at the University of Munich, he began to investigate his cancer patients’ histories and soon learned that, like him, they all had experienced an unexpected shock of one sort or another. But he took his research even further. Pursuing the hypothesis that all bodily events are controlled from the brain, he analyzed his patients’ brain scans and compared them with the corresponding medical and psychological records. To his amazement, he found a clear correlation between certain “conflict shocks”, how these shocks manifest on the organ and how all these processes are connected to the brain. Until then, no studies had examined the origin of disease in the brain and the role of the brain as the mediator between the psyche and a diseased organ. Dr. Hamer discovered that every disease originates from a shock or trauma that catches us completely by surprise. The moment the unexpected conflict occurs, the shock strikes a specific area in the brain causing a lesion (later called Hamer Focus (HH-Hamerscher Herd)), visible on a brain scan as a set of sharp concentric rings. Before Dr. Hamer identified these ringed lesions in the brain, radiologists considered them as artifacts created by a glitch in the machine. But Siemens, a manufacturer of computer tomography equipment, certified that these target lesions cannot be artifacts because even when the tomography is repeated and taken from different angles, the same ring formation always appears in the same location. The brain cells that receive the conflict impact send a biochemical signal to the corresponding body cells causing the growth of a tumor, a meltdown of tissue or functional loss, depending on which brain layer receives the shock. The reason specific conflicts are irrefutably tied to specific areas in the brain is that, during our historical evolution, each brain area was programmed to respond instantly to conflicts that could threaten our survival. While the brain stem (the oldest part of the brain) is programmed with basic survival issues like breathing, reproduction and food, the cerebrum (the youngest part of the brain) is more concerned with social and territorial themes. Dr. Hamer also discovered that every disease progresses through two phases: first, a conflict active phase, characterized by emotional stress, cold extremities, a lack of appetite, and sleeplessness, and then, provided we manage to resolve the conflict, a healing phase. This is the period in which the psyche, the brain and the corresponding organ undergo the phase of recovery, an often difficult process marked by fatigue, fever, inflammation, infection, and pain. Dr. Hamer called his findings “The Five Biological Laws of the New Medicine”, since his research is in full accordance with the natural laws of embryology and with evolutionary logic. Over the years, Dr. Hamer has been able to confirm his discoveries with over 40,000 case studies. 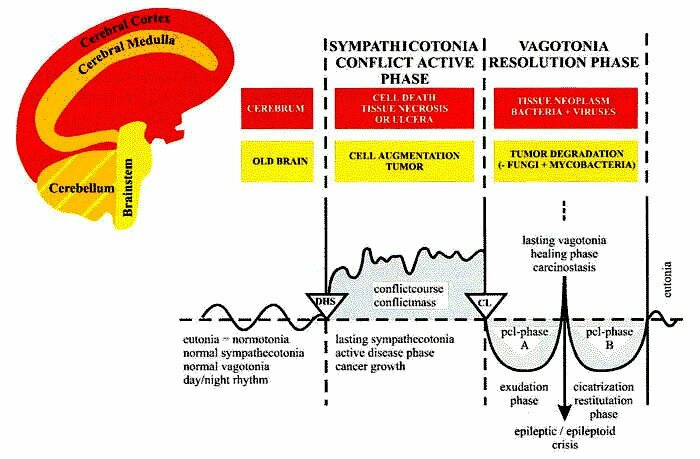 The result of his scientific work is the creation of a “Psyche-Brain-Organ” chart that outlines the disease, the content of the biological conflict that cause it, where the corresponding lesion can be seen on a brain scan, how the disease manifests itself in the conflict active phase, and what can be expected in the healing phase. 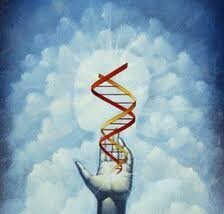 Dr. Hamer’s research radically upsets the many existing theories of conventional medicine. His explanation of disease as a meaningful interplay between the psyche, the brain and the corresponding organ refutes the view that disease occurs by chance or as a result of a mistake of nature. Based on sound scientific criteria, German New Medicine shatters the myths of malignant cancer cells or of destructive microbes and identifies “infectious diseases” as well as cancerous tumors as natural biological emergency measures, in practice for millions of years, designed to save the organism and not, as we have been taught, to destroy it. Diseases such as cancer lose their frightening image and are recognized as meaningful special biological survival programs every human being is born with. In October 1981, Dr. Hamer presented his research to the University of Tübingen as a post-doctoral thesis. The objective was to have his findings tested on equivalent cases so that German New Medicine could be taught to all medical students and patients could benefit from the discoveries as soon as possible. But to his great surprise, the University committee rejected his work and refused to evaluate his thesis, an unprecedented case in the history of universities. There was yet another surprise. Shortly after he had handed in his thesis, Dr. Hamer was given the ultimatum to either deny his findings or his contract would not be renewed. It was extremely difficult for him to understand why he was being expelled from the clinic for presenting well-substantiated scientific findings. After his dismissal, he retreated to his private practice where he continued his research. Several attempts to open a private clinic failed because of concerted efforts opposing it. Letters of Dr. Hamer’s patients to health officials remained unanswered or were returned with the comment: “Not applicable!”. The firm position of the authorities has not changed. In 1985, after 29 years of marriage and the raising of four children, Sigrid Hamer died. She had never really recovered from the grief over the death of her son and the relentless intimidation by the Savoy family. The harassment of Dr. Hamer culminated in 1986, when a court sentence stopped him from practicing medicine. Despite the fact that his scientific work had never been disproved, he lost his medical license , at the age of 51 on the grounds that he refused to renounce his findings on the origin of cancer and to conform to the principles of official medicine. Deprived of a medical license, Dr. Hamer now relied on other doctors to obtain brain scans and patients’ records. But he was determined to continue his work. By 1987 Dr. Hamer had already analyzed over 10,000 cases and was able to expand his discovery of the Five Biological Laws of German New Medicine to practically all diseases known in medicine. Meanwhile, the press and the medical establishment stopped at nothing to attack him and his work. Tabloid journalists and medical “experts” portray Dr. Hamer as a charlatan, a self acclaimed miracle healer, a cult leader, an irrational outsider, or an insane criminal who denied cancer patients the ‘life-saving’ conventional treatments. In 1997 Dr. Hamer was arrested and sentenced to 19 months in prison for having given three people free medical information without a medical license. By contrast, in 1991, thirteen years after he had killed Dirk Hamer, Victor Emanuel of Savoy had been sentenced to a mere 6 months probation for the illegal possession of a weapon. When Dr. Hamer was arrested, the police searched his patient files. Subsequently, one public prosecutor was forced to admit during the trial that, after MORE THAN five years, of 6,500 patients with mostly ‘terminal’ cancer, 6,000 were still alive. And so, ironically, it was his opponents that provided the actual statistics attesting to German New Medicine’s remarkable success rate. Yet, to this day the University of Tübingen refuses, despite court orders in 1986 and 1994, to test Dr. Hamer’s scientific work. Similarly, official medicine refuses to approve German New Medicine despite its numerous verifications by both physicians and professorial associations. On September 9th, 2004, Dr. Hamer was arrested at his home in Spain. Following a European extradition order, Dr. Hamer was extradited to France, where he was held in the French prison Fleury-Mérogis. Dr. Hamer was sentenced to three years in prison without probation. The charges: “fraud and the complicity in the illegal practice of medicine” He has been charged and found responsible for the deaths of French citizens due to the availability of his publications in French. It should be mentioned that Dr. Hamer had never spoken to any of the individuals in person. Dr. Hamer was released in February 2006. In March 2007, he was forced to leave his Spanish exile. He is now living in Sandefjord, Norway. Remember: We don’t treat cancer and you are advised not to use laser treatment on a cancer patient. It is against the law to kill cancer cells and obviously not against the law to kill cancer patients. You will not get in trouble for what you do. You can get in trouble for what you say. The ‘tracks’ in the DHS are analogous to the environment, the circumstances that create an association in the second of the DHS. A professor interested in allergies once described this very well with the following formula: “If you suffer a DHS with a biological conflict and a cow happens to be passing, you will develop an allergy to cows, but if you happen to be biting into an orange, you will develop an allergy to oranges.” In the instant of the DHS, humans and animals are unconsciously ‘aware’ of their environment. These circumstances later result in so-called allergies. A second case: During a flight that a couple took from Senegal to Brussels, the husband suffered a heart infarction. They were incapable of doing anything and the wife suffered a death fright conflict from her concern for her husband who could have died at any moment. After landing in Brussels, the husband was rushed to hospital where it was determined that the infarction had not been that severe and he quickly recovered. His wife, however, fell ill several times with a solitary lung-nodule, after which she would perspire heavily for days or weeks when the tumor would be gone, caseated by the tubercular bacteria. A solitary cancerous nodule was discovered one day when the patient had again started sweating at night. Her physicians in Brussels were at a loss and requested my assistance. I asked the patient the same questions they had asked her since they were familiar with the German New Medicine: whether her husband was sick again and whether she feared for his life. She said her husband had felt quite well since the heart infarct on the plane. I then asked whether her husband had flown again. She said neither of them had flown since that occasion. She then said she thought her problem was related to planes because ever since that terrible event on the flight from Senegal, she would panic any time her children or grandchildren had to fly; she would feel a death fright for weeks until they were safely back in Brussels. That was exactly what had happened until the solitary lung-nodule was discovered through an aspiration and diagnosed as an adeno carcinoma. As we can clearly see, the patient suffered a second ‘track’ during her husband’s heart infarct crisis on the plane. This second track is associated with the DHS as a fear of helplessness during the event on the plane. The patient had what every psychologist can understand – a death fright for her husband that re-activated the track by itself as she ‘associated’ the event anew every time a family member took a plane. It was not really a logical response since her family was young and unlikely to suffer a heart infarct. However, that was not the issue. The point was that the ‘plane’ became a separate ‘track’ connected to the ‘death fright track’ and created a second conflict, a conflict-complex situation, so that every time a member of her family travelled by plane, the patient suffered a recurrence of a solitary lung nodule – the sign of having gone through a death fright for another person. The best way to solve the conflict was for her family to only mention travel by train, even though they really travelled by plane. The patient, a mother and grandmother, would thereafter only hear about their train travel or was only told about a trip after their return. These examples demonstrate the importance of getting back to the DHS in order to recall the exact situation at the moment of its origin. In philology, this would be called a context: an important passage from a text cannot be omitted, as the text must be understood in its entire context. You can find more info and a summary of his work by entering the following into your search engine. You can read a transcript of his lecture online. Unfortunately the book is out of print on Amazon.